C was developed at Bell Labs by Dennis Ritchie for the Unix Operating System in the early 1970s. C has a compiler for most computer systems and has influenced many popular languages. C is a high-level and general-purpose programming language that is ideal for developing firmware or portable applications. C programming is still popular for its simplicity of expression, compactness of the code, wide range of applicability and limitless flexibility. Extensive use of function calls. Loose typing – unlike PASCAL. Low level (BitWise) programming readily available. 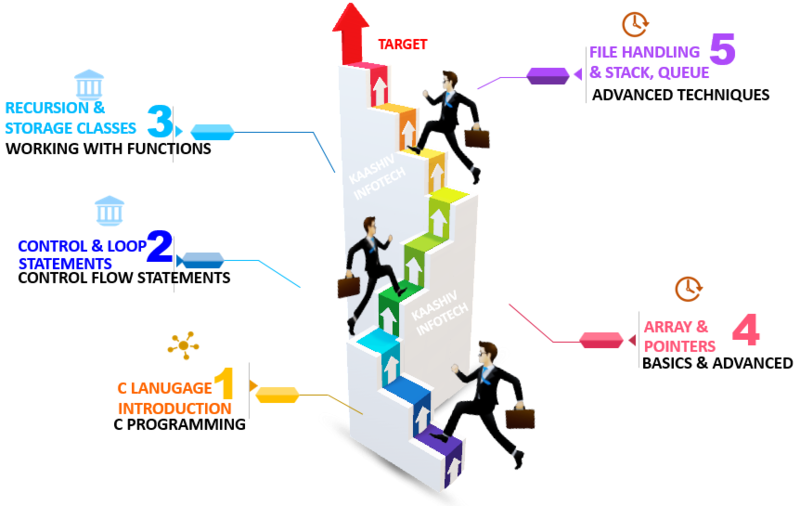 Why KaaShiv InfoTech Company to learn C Training in Chennai? Kaashiv provides Best C Training in Chennai with professional trainers who provide real-time training and also projects to the candidates for better understanding. Why Students Enroll for real time C Training in Chennai ? Like most of the procedural language, C has the specialized feature for structured programming, allows variable scope and recursion. C Programming Course Training, provides a real-time exposure for the students on the latest and trending technologies. Students undergone C training will be expertise in C Programming and automation testing + real time Software Implementation. For C Training 120 concepts from Basic to Advanced will be covered.